Elsewhere – Apples, plums, quince, thyme, sage (green and purple) , chives, rosemary, mint, curly parsley, oregano and marjoram. Plans – Erect a little greenhouse and grow tomatoes. Your veg patch looks wonderful. I would love to try and grow some raspberries. A wonderful corner there Wendy. I don’t see any basil in your listing…do you not like basil? Sounds like a plan Wendy! What I would like to know is how you fit so much into each day, do you have a tardis? Such an impressive veg patch, Wendy. You certainly put my efforts to shame. Haven’t had gooseberries for ages – what a treat those will be. Sylvie – I saw that recipe. It looks absolutely amazing! And I’m not even that bothered about cakes. Jules – It’s lovely coming home from work and just popping a few freshly picked rasps into my mouth. Truenorth67 – Basil grows inside on the window sill. It’s too cold, even in summer, here to grow it outside. It is one of my favourites though. Holler – Lol! Get it from my Dad. He never sits down! Antonia – Nonsense! I’m hugely impressed by all you’re growing despite a lack of space. Great to have a photocopy somewhere in the wolrd! So much in so little space! Wonderful! I am envious of your fruit trees. Silvia Magnolia – Sardinia? I thought you were in Florence, for some reason. Christina – Yup, I’m packing everything in! Very neatly done, Wendy – bravo! I hope to do something similar in a disused (rubble-filled) patch of our garden before too long. Will follow your progress with interest! That’s awesome! Great veg patch. Just out of interest, how many corn plants do you have? I’ve heard that you need quite a few for them to pollinate each other. Is that a compost bin I spy in the corner? I “made” one of my own out of a trash can a drill and bungee cords this weekend. Any advice on composting to share with a total amateur? Barkley and I have planted tomatoes, japanese eggplant, squash, zuchinni, red peppers, yellow peppers, and okra. Hopefully I don’t have to do any plant funerals this summer 🙂 We’ll see though. Aforkfullofspaghetti – This is only my second year growing so I’m going to be interested to see what happens too! Helen – I have about 10 corn plants in a double row. Was supposed to plant them in a bunch but didn’t have space. Who knows what’ll happen. * You can compost all raw vegetable and fruit (peelings or past their best food). * Nothing cooked or animal derived. * Egg shells are good though. * Add grass cuttings or twigs from time to time to help air circulate. *Use compost from the bottom of the composter. I waited a year before starting to do this. 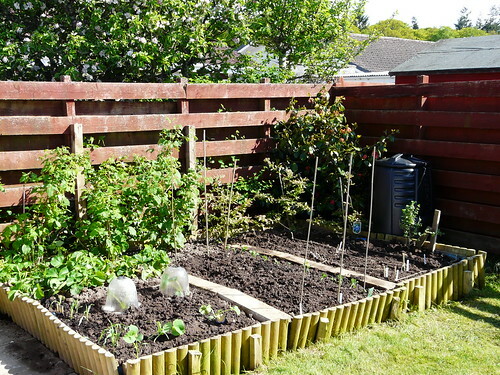 I love your beds and I too love growing veg. Someone mentioned why no basil. I`m also from Scotland and have to grow it in a greenhouse or indoors. Puts my garden to shame- I only have a old ceramic sink full of herbs. Do you do contracting work!? Looks (and sounds) fantastic Wendy. Nothing beats requiring something and pottering to the garden to get it! Karen’s Kitchen – Thank you! I grew basil in a wee greenhouse last year too. It was a rather tough variety though. Will be more picky this year! Lucy – Yeah, me too. It’s an odd leaf indeed. Sarah – The ceramic sink sounds quite cool to me!